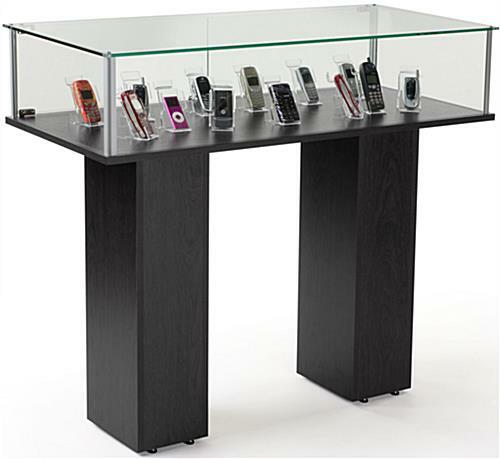 This Glass Pedestal Showcase is a Perfect Addition to Retail Stores. In Stock Now and Ready to Ship. This Glass Pedestal Showcase Ships Unassembled. Extruded anodized aluminum frame blends well with glass cabinet for a seamless and unobstructed view of items. Black veneer finish on an MDF deck and legs blends well in any décor. Tempered glass cabinet for a safer alternative to traditional glass. 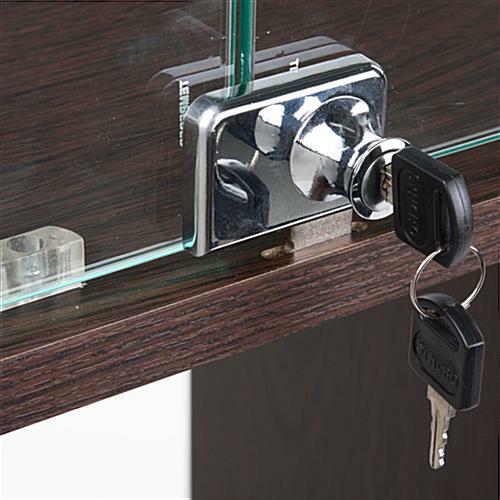 Hinged glass doors with keyed lock to securely display expensive items. (2) Full width doors have hinges and swing out for full access to display space. This glass pedestal showcase includes a lock and key so items placed inside are only accessible to the appropriate people. This cabinet is made with glass panels held in place by anodized aluminum extrusions set atop an MDF base. 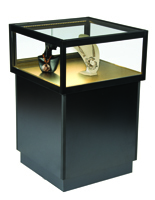 This glass pedestal showcase that uses tempered glass is safer than traditional versions that can shatter. This display comes with two rectangular pedestal legs made of MDF (medium density fiberboard) that has a black veneer finish. 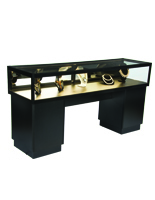 These glass pedestal showcase that are ideal for displaying jewelry have a 45" wide viewing area to display an ample amount of items. 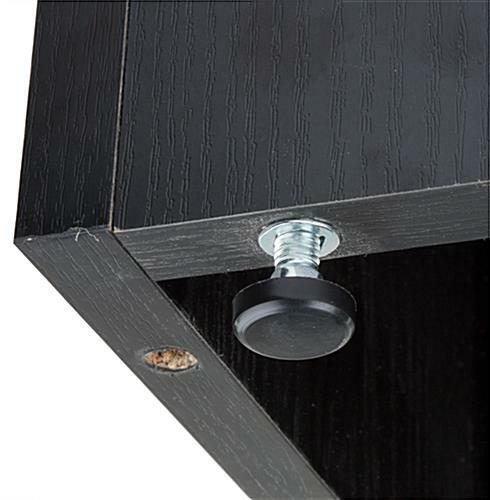 This jewelry cabinet includes adjustable floor levelers to suit nearly any establishment. 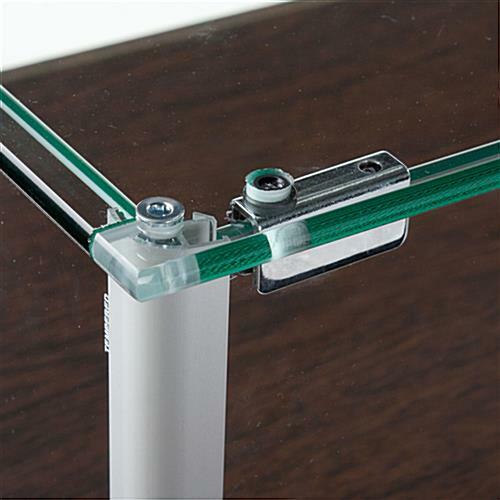 This glass pedestal showcase ships unassembled to save on shipping costs and includes paper instructions as well as a step by step assembly video as can be seen below. This display table is designed to promote products or prominently display special items. 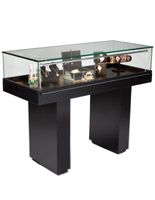 This glass pedestal showcase is offered at a wholesale price! This museum cabinet is ideal for showing relics and even for encasing jewelry or sunglasses at a retail store. 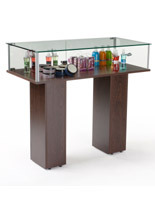 This European designed glass pedestal showcase is stylish and blends well in many environments. This store cabinet has a black veneer deck so products placed inside stand out. This glass pedestal showcase includes hinged glass doors with a keyed lock so items inside are only accessible to key holders. This display with a European design is offered at a great price! This glass pedestal showcase provides an unobstructed view of merchandise so potential customers can view items clearly.